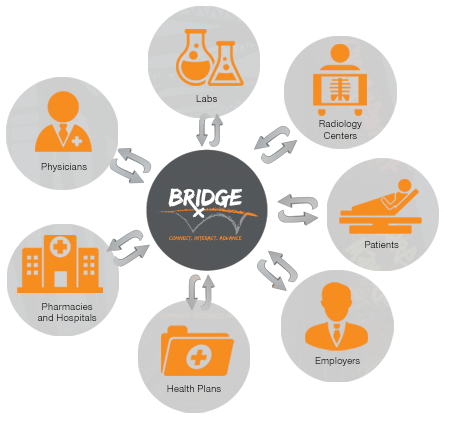 Bridge is a collaborative population health management, software platform where Providers, Care Managers, Patients and Physicians collaborate more effectively for improved patient care and lower costs. This SaaS-based platform connects providers and enables real-time patient information exchange, facilitates referral management, secure messaging, patient tracking, patient communication, clinical data management, clinical integration, clinical intelligence and clinical analytics. The platform allows providers and patients to interact with each other to exchange, discuss and track patient information, strengthening relationships and revenue streams, allowing them to advance and improve operational efficiencies and meaningful continuity of care across the care continuum. Various ACOs, IPAs and other health systems are currently using Bridge to impact their organizations. Intrigued? Want to know more about how the Bridge is bridging the care gaps?